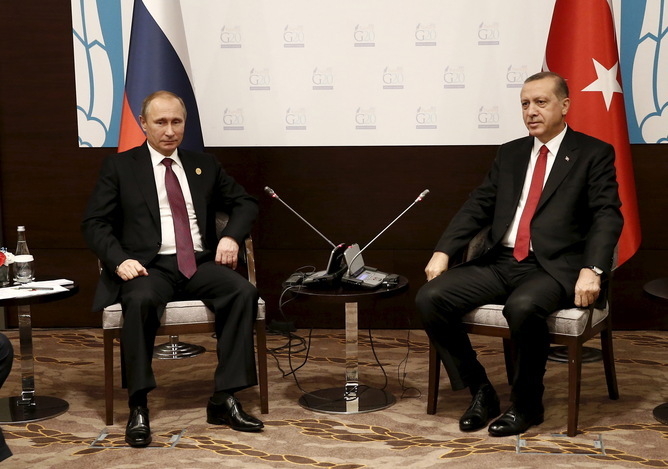 Are Putin's Economic Sanctions on Turkey the end of a Golden Age in Moscow-Ankara Relations? 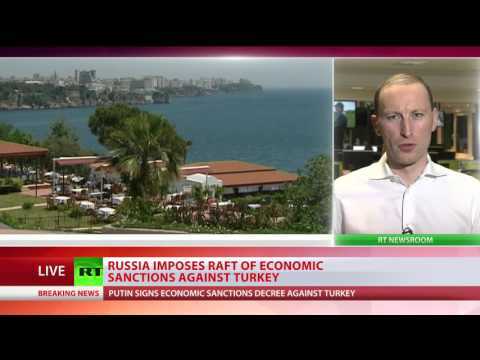 Are Putin’s Economic Sanctions on Turkey the end of a Golden Age in Moscow-Ankara Relations? In locking horns over Syria, Russia and Turkey are playing out the latest chapter in a rivalry that has spanned centuries. Since the 1600s the two have lurched between conflict and uneasy friendship. But the war of words that has erupted since Turkey shot down a Russian jet it claims entered its airspace this month has notched tensions up to levels not seen for some time. Russia and Turkey emerged as independent powers almost simultaneously – in 1380 and 1389. There followed a spectacular rise for the Ottoman empire, which expanded rapidly and had become a superpower by the 16th century. Russia was relatively under resourced and surrounded by more powerful neighbours. Only in the late 16th century did it emerge as a major European power. A direct rivalry with the Ottoman empire began in the 17th century when Russia joined the Holy League alliance with Poland and the Habsburg Empire, taking significant territory from the Ottomans – although importantly not Crimea. The 18th century marked a turning point in the Russo-Ottoman relationship. 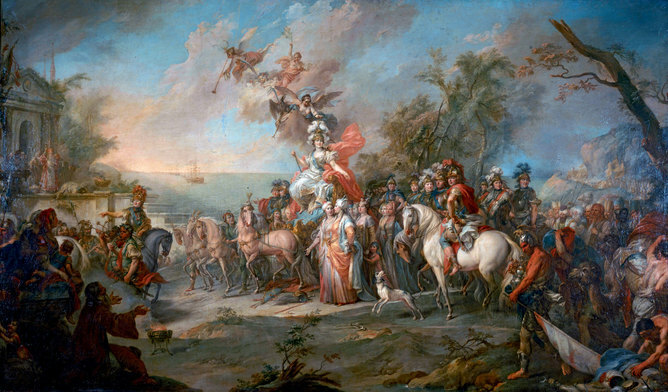 Peter the Great’s westernisation reforms strengthened Russia. And under Catherine the Great, it scored a series of strategic victories over the Ottoman empire, taking control of the northern part of the Black Sea after the Russo-Turkish war in 1768-74. Crimea was made independent from the Ottomans as a prelude to its eventual incorporation into the Russian empire in 1783. Allegory of Catherine’s Victory over the Turks, by Stefano Torelli. The war was the first time the Ottoman empire lost Muslim subjects to a Christian state. Turkey has been sensitive about the loss ever since – which helps explain the tension that arose after Russia annexed Crimea in 2014. Another important episode was the Russian conquest of the Caucasus in the first half of the 19th century. After their defeat, about one million Caucasus Muslims migrated to Turkey. These communities still live in Turkey, which influenced Turkish attitudes to the Chechen wars in the 1990s. Both nations emerged in a radically different form after World War I. Russia had become a socialist state and Turkey was on the path to secularist modernisation. Both losers in the global conflict, the two maintained good relations in the 1920s, settling their territorial disputes. But Russia began to apply pressure to Turkey after World War II. It wanted control over the Turkish straits (the Bosphorous and Dardanelles) and territory in eastern Turkey. This was a key factor in the development of the Truman doctrine (1947), when the US assumed global responsibility for containing communism, thus formally launching the Cold War. Turkey received substantial US military support, abandoned its neutrality and joined NATO in 1952. Immediately after Stalin’s death in 1953, the USSR apologised to Turkey and renounced all territorial claims. Relations between the two rapidly improved, in no small part because of Turkey’s increasing disillusionment with its Western allies. When Turkey faced sanctions after invading Cyprus in 1974, the USSR capitalised by offering economic assistance. After the collapse of the Soviet Union, the already significant economic links continued to strengthen, particularly in the new fields of tourism and consumer goods exports from Turkey. Their relations were, however, complicated by the changing geopolitical landscape. Turkey was open to exploiting pan-Turkic ideas and challenging Russian influence in the newly independent Turkic-speaking states of Central Asia and Azerbaijan. Relations with Armenia also remained a highly sensitive point. Turkey has a history of tense relations with the Armenians going back to the 1915 genocide. 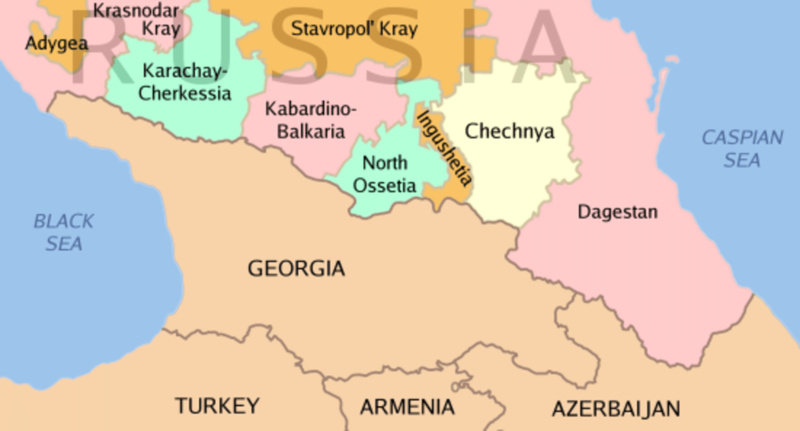 It also supports Azerbaijan over its frozen conflict with Armenia in the Nagorno-Karabakh. Meanwhile, Armenia has remained Russia’s most staunch ally in the Caucasus. However, the Chechen wars posed the greatest challenge to Russo-Turkish relations in recent times. Chechen separatists enjoyed wide support from Turkish sources, and Moscow showed its discontent by extending a hand of friendship to the Kurdish Labour Party – the separatist movement that has railed against the Turkish government. Eventually both countries agreed to sever ties with respective insurgents and normalised their relations. A golden age followed. Economic ties were solidified by personal relations between Recep Tayyip Erdoğan and Vladimir Putin. An undersea gas pipeline was built in 2003 and by 2014 Russia had become the top importer to Turkey. Tourism also emerged as a major link between the two countries, with Russia sending the largest number of tourists to Turkey in the years 2013-14. There are ambitious plans for a construction by the Russian Rosatom of the first nuclear plant in Turkey at Akkuyu, worth $20bn, as well as negotiation for a new gas pipeline, designed to bypass Ukraine for Russian gas exports to Europe. Now, however, all these are likely to be put on indefinite hold due to the fall out over Syria. The conflict in Syria has led to Turkey hosting more than 1.7 million refugees. The role of the Kurds in the conflict is also antagonising Ankara and puts Turkey at odds with its Western allies. Putin and Erdogan shortly before the jet incident. Ankara’s objective is to protect the rebel groups it is supporting in Syria – particularly the Turkmen but also Muslim Brotherhood-affiliated groups fighting Assad. Shooting down the Russian warplane can be interpreted as a way to impose a no-fly zone along the Turkish-Syrian border. That protects Turkey’s protegés and forces other powers to recognise Turkey’s special status in the region. Russia’s approach to the Syrian civil war is in no small part based on Moscow’s belief that secular authoritarian rulers are the only effective bulwark against radical Islam in the Middle East. The Kremlin sees radical Islam as a threat to its domestic security and the international order. It supports Assad to stress the illegitimacy of regime change through popular revolt or external pressure. In Moscow’s view, such movements potentially endanger its own legitimacy and create chaos in international relations as witnessed in Iraq, Libya and, from its point of view, Ukraine. Russia is also, of course, keen to play a leading role in the Middle East to assert its status as world power. And now Turkey and Russia have openly clashed for the first time in more than a century. It remains a highly-charged situation – yet one that is simply another twist in a long and complex relationship.